The Qt Quick 2 surface example shows how to make a simple 3D surface plot using Surface3D with Qt Quick 2. The focus in this example is on generating a surface graph from height data, so in this section we skip explaining the application creation. For more detailed QML example documentation, see Qt Quick 2 Scatter Example. This example shows two methods to set data to surface graph, using the HeightMapSurfaceDataProxy and ItemModelSurfaceDataProxy. First we go through setting the data using the height map specific data proxy. It is done with the code snippet below. The proxy itself is contained in a Surface3DSeries. Inside the HeightMapSurfaceDataProxy the heightMapFile specifies the image file containing the height data. The value properties in the proxy define the minimum and maximum values for surface area width and depth. 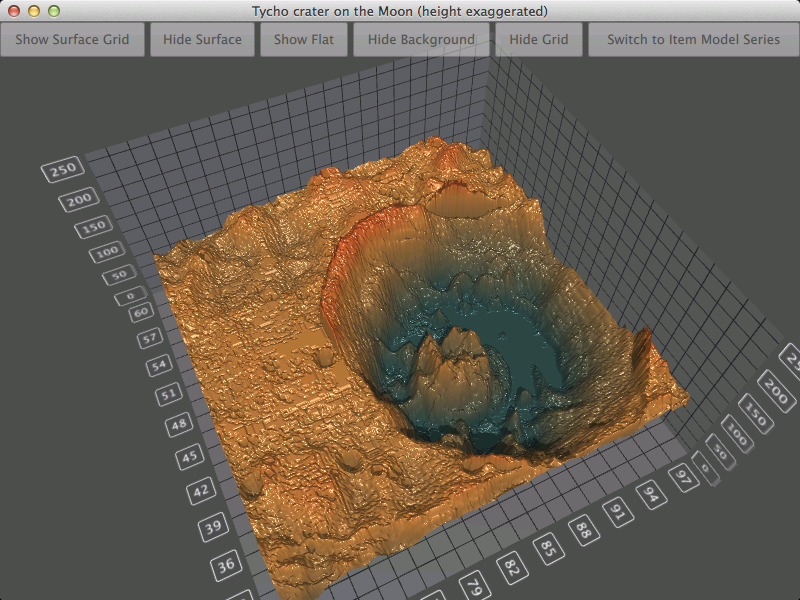 This example shows the terrain around Tycho crater at imaginary position from 67 to 97 and from 30 to 60. Note that on the graph the scale on the Y dimension exaggerates the height. // We don't want the default data values set by heightmap proxy. We add the actual data to the itemModel of the ItemModelSurfaceDataProxy. We also define the roles for columns, rows and values. In this example the row holds values for longitude, column for latitude and the value is for height. In the main.qml, we set up the Surface3D element to show the data and various UI elements to illustrate few interesting features. First is the gradient to be used for the surface, which can be defined as seen in the following snippet. With the ColorGradient we set example colors from position 0.0 to 1.0. Other interesting features can be controlled with buttons. Notice that the drawMode and flatShadingEnable properties are set for both series. Fourth and fifth buttons are for controlling background features. text = "Switch to Height Map Series"
text = "Switch to Item Model Series"
We also set the maximum value to 500 in model proxy to make the surface flatter and 250 on height map proxy to show exaggerated height. At the same time the middle color position on the gradient is modified to match the value range change.